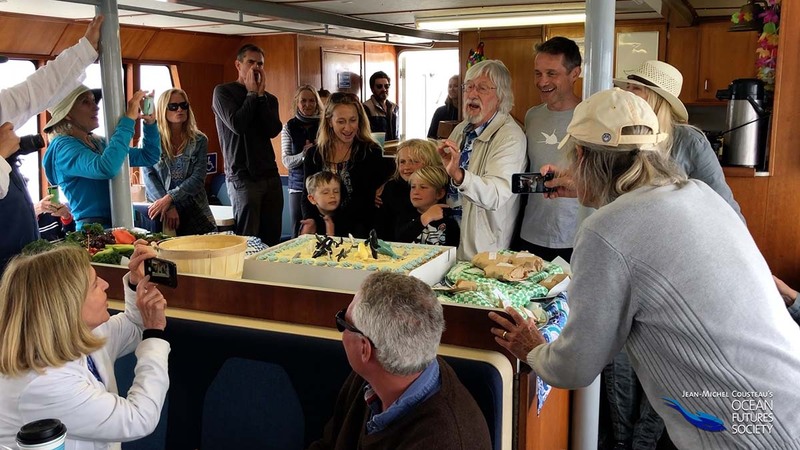 I was honored to celebrate Jean-Michel Cousteau’s birthday recently aboard the Condor Express Whale Watching boat off Santa Barbara. Jean-Michel invited 100 of his family and friends to celebrate the ocean together. It was a beautiful day on the ocean with reasonably calm seas, clear skies and very cooperative wildlife. Soon after leaving the harbor we encountered a playful pod of common dolphin that rode the pressure wake on our bow, much to the delight of the kids that were onboard. Soon after, we saw a cow/calf pair of gray whales slowly making their way up the coast towards Alaska on their annual migration. After lunch, Captain Dave Beezer spotted a white shark basking on the surface near shore – something that amazed us all! Dolphins, gray whales and white sharks – what more could we ask for? According to Jean-Michel, it was his wish to gather his friends and family to celebrate the ocean together, and he accomplished this with flying colors! I brought along my Mavic Pro drone, iPhone X and Canon 5D Mark lll to quietly and discreetly shoot scenes during the day – and surprised him with this short video of his birthday. It was a magic day that I will always remember!